Today, I’ll be walking you through setting up PageSpeed Insights within your existing gulp project. This way, each time you call gulp psi in your terminal, you can get your page speed insights scores right in your terminal without needing to push your site to a live server, navigate to the PageSpeed Insights website, enter in your URL, etc. 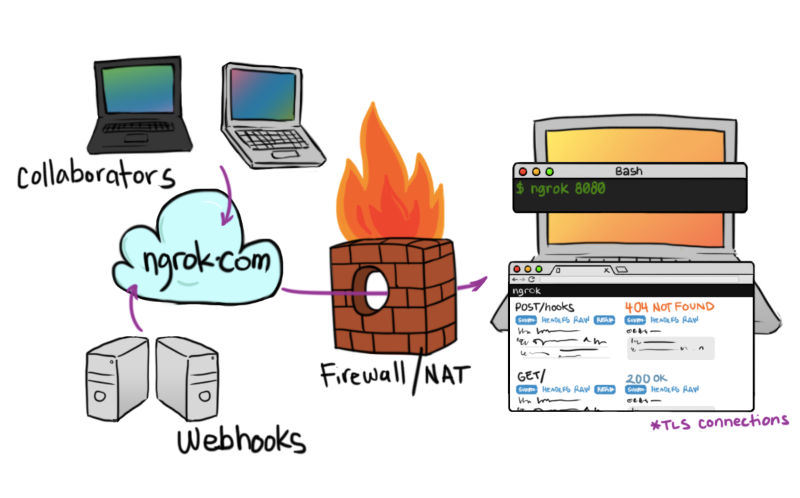 I’ll be using ngrok to tunnel your locally hosted site and a few gulp tasks to bring it all together. PageSpeed Insights is a project by Google that analyzes the performance of your website, giving you a score index based on a variety of factors. Addy Osmani created a neat little node module so that we can run PageSpeed insights right in the terminal and get a nicely formated table of scores. To install this tool globally (which I recommend, because you can use it with any live website, any time), simply type npm install -g psi into your terminal. Unfortunately, PageSpeed Insights (psi) doesn’t work on locally hosted websites. So, if you try running psi http://localhost:3000 it won’t work. But that’s okay. There are brilliant people on the internet who have developed solutions for us. Enter ngrok! I shamelessly stole this infographic from ngrok's website. That Forwarding URL is what we’ll use to get our page speed insights. Try it now. Type psi <your forwarding url> and you should see a response! Pretty cool right? And then run npm install. Great! Now you have the psi, ngrok, and run-sequence modules installed. create a task to run ngrok and grab the tunnel url it is creating. Again, I am using port 3000 here. If you’re wondering what cb is, it stands for callback, and its what allows you to define the end to an asyncronous task. We’ll see this again in the psi tasks below in a second. Now we need to add a few tasks for page speed insights in the gulp file. We’ll be referring to Page speed insights as psi. These tasks are pulling from an example given by Addy Osmani. And psi tasks. Here we’re making seperate tasks for both mobile and desktop strategies. For configuration information, check out the repo. If you’re using an API key, be sure to replace the nokey: 'true' line with your key: <your API token here>. Now, everything is almost ready. The only problem is that we need to link the tunnel url that ngrok is creating for us to psi. For this, we’re using the run-sequence module to alow variables to pass between in between asynchronous tasks. We’ve only got two more variables to set up. Now, we can create a sequence to run the ngrok tunnel server, grab its url, and run page speed insights tests for both desktop and mobile. So at this point, if you have a server running at port 3000, and run gulp psi in another terminal window, it should give you accurate results. But let’s improve on that. Let’s make a self-contained gulp task that doesn’t depend on another. Servers, Ports, and Tasks, oh my! BrowserSync is really cool in the sense that if a port is taken (i.e. if port:3000 is busy), it will use the next available one (i.e. port: 3001). This can cause issues if you aren’t cognicant of it and may be running multiple development environments at once. Well, what will likely happen is you’ll just get a false 100 in return for your page score value. Because we’re specifying the port here, we have to make sure that it is available to avoid those faulty scores. To improve this a bit, I set up a separate BrowserSync function seperate from my development task, specifically PageSpeed Insights. This got rid of some of the excess (watch tasks, etc), and I also gave it some more configs like not opening the page in the browser every time I just want to test performance. Thanks AJ for pointing out the API syntax update and Chris for updating the article!